That’ll Do Donkeys, That’ll Do. Perhaps you awoke this morning, exfoliated in the shower, chomped on your fibrous cereal of choice, and checked out the news, only to see that a certain buzz-term that fast became household vernacular is suddenly threatening to leave us. If you said “Blue Dog,” go bark up another tree. If you said “Public option,” have a Scooby Snack; you’ve earned it. That’s right, nine days into closed-door negotiations in the Senate between the Gang of Ten as they are being called (five more liberal Democrats and five centrists), Majority Leader Harry Reid, who is not one of the group, popped out and announced with an odd optimism that a “broad agreement” has been reached and it includes scratching the public option. Maybe he’s not familiar with another DC buzzword: “Agreement.” (Who down there is?) Or maybe this is a good deal. Let’s unpack this development from two sides. At first glance, this news reminded me of a tweet from a few months back: “@pourmecoffee: every Senator should have an animal name. Harry Reid is ‘The Bat of the Senate’ because he always caves.” Today’s New York Times originally led with, “Reid Says Deal Resolves a Dispute on the Public Option.” Man, talk about massaging language. That’s giving it a sensuous shiatsu and throwing in some aromatic Swedish oils. Resolves? Capitulates? What’s the difference? Olympia Snowe may have flurried away from a vote with the Dems, eerily coinciding with an icy weather mix near in her home state of Maine, but now, reports say the irksome Independent that is Joe Lieberman is in play. So, Reid rolled over, right? The base of his party has been fighting tooth-and-nail for a government-run insurance option for most of a year. They had already conceded four or five iterations of it to gradually less robust versions. All of these plans are dead or just about dead if not in Congress at-large, at least in the Senate: single-payer (terribly named), Medicare for All, state opt-out, and state opt-in. 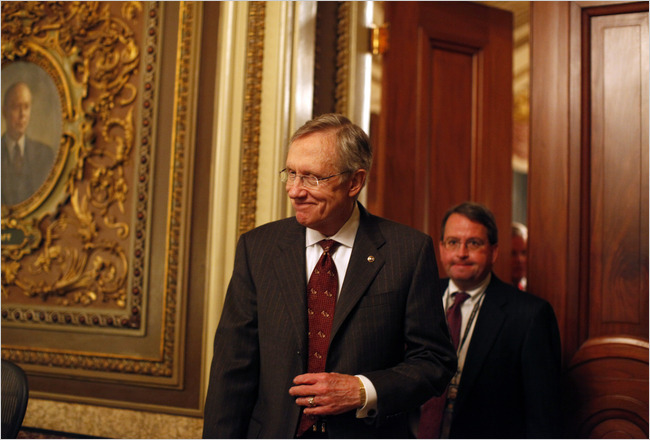 An underwhelming Quinnipiac poll taken pre-Reid announcement shows that 38% support the bill. Guess that’s likely to happen when 56% also support the choice of being covered by a government health insurance plan, virtually unchanged since before Thanksgiving. Now, without the option, where will the bill’s support stand? Part of me thinks it is unbelievable that with just under 60 Democrats the party was not able to get a semblance of their original plan through the Senate. But, all of these characters are worried about reelection and some are barely Democrats. Still, was there no way to broker a deal to get a moderate to fall on the sword and take one for the team by voting for a public option even if it meant their job? A backdoor agreement could have that lucky Senator winning a Showcase Showdown to be a political appointee 8 months from now: a special envoy, an ambassador to Tahiti, whatever. In the end though, the reality is that the party of donkeys came up just shy and couldn’t do much to sway the moderates. An expansion of Medicare down 10 years in age to people between 55-64. A public option “trigger” if no private agencies want to partake. Uh, that sounds good. It also happens to be a ton better than what we have now. The change to the public option framework is philosophically different… but does it matter as long as there is a strong force that creates competition, fairness and affordability in the market? After seeing that list, it borders on semantics. And looks like smart political maneuvering. A concern, though, is that the government subsidizing private insurers to do the work of a public option threatens to make things more expensive than a public insurer could. It’s akin to how federal housing loans are actually made by private institutions, but underwritten by the Federal Housing Administration. Why is that? Obama has asked the same question. It seems like a circuitous, excessively wasteful administrative process to push money around though middlemen when the government is on the hook anyway. In addition, the abortion restrictions that unexpectedly passed in the House (aka the Stupak Amendment) were voted down last night 54-45 in the Senate, in a bill presented by Nebraska’s moderate Democrat Ben Nelson. Oh, abortion, you rascal. Nothing like a good ol’ wedge issue to muck up an already messy floor fight. Wait a minute! This all sounds awfully familiar… like we’ve heard it before, in dozens of states, regurgitated at town halls, in debates, even in some landmark speeches. How can this idea be so pervasive in so many places and so many forums? Oh, right. It was Barack Obama, presidential candidate. In all of them. And, lest you forget, if everything goes down as it seems right now, Democrats can run ads next fall on how their opponents voted against making sure insurance companies can’t discriminate on the basis of pre-existing conditions. Further, the Medicare for 55+ component would go into effect in 2011, making it highly campaign-able in 2012. If this framework holds muster, the differing House and Senate bills will need to be reconciled. And there will be some steamed progressives in the House to address. But Anthony Weiner’s (D-NY) not one of them. So, progressives should keep their eye on the ball. After all, this is progress.